Thursday February 6th 1902 More pleasant. Did churning early and got the butter ready to go to town in the afternoon. Terry helped me wash but I did not get done till two oclock. It was late when I got my work done up. Friday February 7th 1902 I did ironing before noon. It was too cold for me to get to town with Will so I did a little sewing. Lib came for Mollie tonight. I read in the evening. 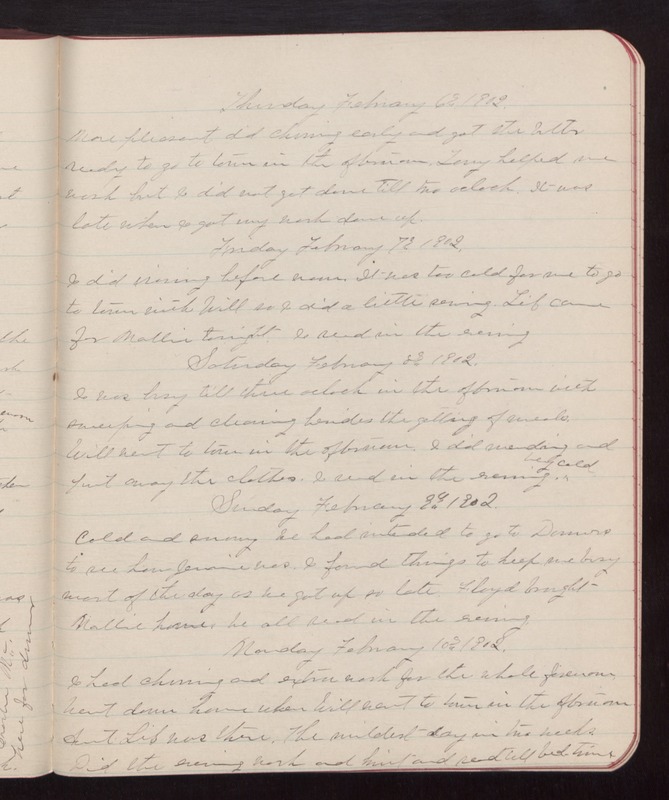 Saturday February 8th 1902 I was busy till three oclock in the afternoon with sweeping and cleaning besides the getting of meals. Will went to town in the afternoon. I did mending and put away the clothes. I read in the evening. very cold. Sunday February 9th 1902 Cold and sunny. we had intended to go to Danners to see how Jennie was. I found things to keep me busy most of the day as we got up so late. Floyd brought Mollie home. We all read in the evening. Monday February 10th 1902. I had churning and extra work for the whole forenoon. Went down home when Will went to town in the afternoon. Aunt Lib was there. The mildest day in two weeks. Did the evening work and knit and read till bed time.